CooksRecipes has quality, kitchen-tested recipes for bacon, ham and pork appetizers, canapés & hors d'oeuvres that are perfect for parties and entertaining. 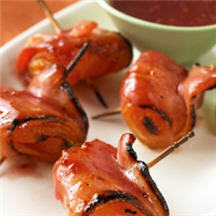 A scrumptious apricot version of rumaki, the soy-marinated, bacon-wrapped water chestnut and chicken liver appetizer. 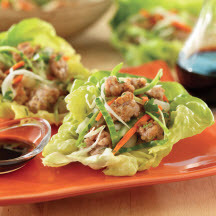 This versatile dish can be served as an appetizer or as an entrée. Set up an assembly line to make these fun won tons. 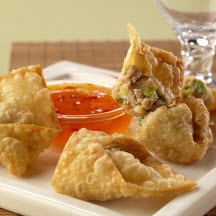 Younger cooks can help fill and seal the won tons, but have an adult do the frying.